Katya Ivanova learns about love at first sight early in her life. The first time she lays eyes on an airplane, in the small Russian village where she lives with her washwoman mother, she vows that someday, somehow, she will rise above her circumstances and become a pilot. Katya and her mother, a widow who has very little status in the town, demand that she receive the same education as the boys and, with a bit of pushback from her very sexist teacher, their requests are met. There begins Katya’s journey to the skies. 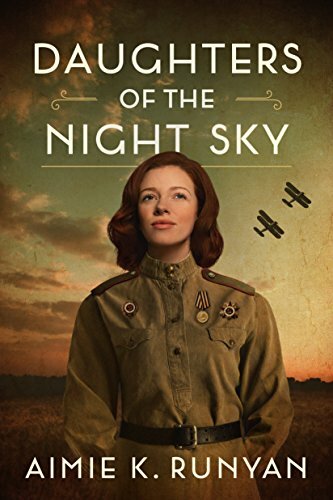 Years later, she attends flight school in the Ural Mountains and, during World War II, Katya finally gets to live her dream of seeing the world from an airplane, first as the navigator for the man she ultimately falls in love with during flight school and then with her sisters-in-arms in the 588th Night Bomber Regime, one of the few female-only Soviet air units. She and the other “Night Witches,” as they are named by the Nazi troops that they terrorize each night, are fearless in the face of battle and begin breaking flight records almost immediately. But Katya quickly learns that, often, having one thing that you’ve dreamed of for so long can mean giving up another. She feels pulled in many different directions as the war rages on, and she is torn between the loved ones that remind her that, as a woman, her position is a volunteer one and she can excuse herself at any time. Katya comes to learn that war is not without sacrifice and is changed in ways she could never even imagine. Runyan expertly captures the voices of Katya and her regime in Daughters of the Night Sky, expressing their fears, their pride, and their bravery in the face of unthinkable circumstances, teaching history along the way, but never losing sight of the fact that it is these women who make this story so remarkable. Fans of historical fiction or tales of women defying the odds will be immediately drawn in to Runyan’s crisp, effortless prose. Kristy Woodson Harvey is the national bestselling author whose most recent novel is Slightly South of Simple (Gallery/Simon & Schuster), the first book in her new Peach Bluff Series.